“Remind me” is the best part of Premember. It makes it possible to look back in time so you see what you have been working on instead of guessing what and when the work has been done. You can look back to up to thirty days! Now you don’t have to sit down and ponder what you did last week. You can simply look it up. Below you can read how to configure and use Remind me. You can also watch Tutorial 2 : remind me. The next image shows the “Remind me” screen before and after configuring filters. In the following document i will explain how it all works. You installed Premember and created a project. Now you want to see how “Remind me” works. Premember started capturing your actions the second you installed it. Taking screenshots when you changed from window and periodically saving if you worked for a time with the same program . You only have to tell what you want to be reminded of. This is done by creating filters. 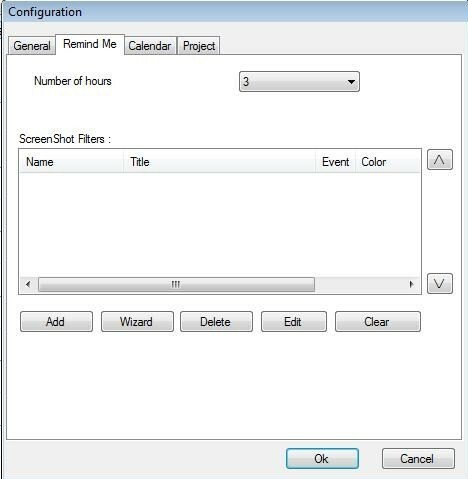 To configure filters click on configuration in the calendar screen of Premember and select the “Remind me” tab. This tab shows the filters you configured but since this is the first time it’s blank. It’s important to know that you can only select programs you have used since you installed Premember. You can open the program for a split-second to let “Remind me” take a screenshot and then configure a filter for it. Click on wizard to start configuring filters. We will start with creating a filter for Firefox. Type firefox as name and click next. The next step is to select what kind of filter the default setting is “based on title” so use this setting and click next. The next step is to select the day when the program was used. “Remind me” uses the name of the windows to see what you have been working on so you now have to select the day you used the program. In this example that’s today. If you click on the pull-down bar you will get a overview of all the window titles of the screenshots taken on the day you selected. I have selected “hesiod software – next gen…. mozilla firefox” now this only gives me the corresponding webpage but i like to see all the times I used firefox. So I will delete the hesiod software part and replace it with a wildcard(*). Click next, now you can select a color I selected green. 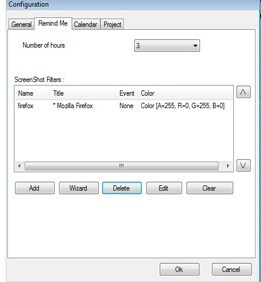 this color is shown in the “Remind me” screen at the times firefox has been used. click “Ok” and then click “Complete” to create the filter. Now it’s visible in the filter list. Now I will configure a filter for paint and camtasia. I have not used camtasia after installing Premember. So I will open it and then configure the filter with camtasia. I replace the file extension at the end with a wildcard(*) to see all files edited with camtasia. There are a lot more options with “Remind me” filters but I’ll keep it basic for now. Now with the filters configured let’s open the remind me screen to see how it shows the filters. Click “Ok” to exit the configuration screen, and click on Remind me above the day you wish to view, this opens the “Remind me” window. Now it’s visible when I worked with paint (yellow), Firefox (green) and camtasia (the red line at 2:07). You can click on the image to zoom. On the left side the day of the calendar you selected is shown. Right of the calendar day is a time bar showing three hours in detail. the overall time bar is situated on the bottom of the screen. Both time bars display the (filter) colors you selected. You can browse through the screenshots with the sliders or by using the arrow keys. Above the screenshots the following information is visible : The time the screenshot was taken in red, the time selected with the slider in green followed and the window title. You can also right click on the time bar to display a legend to see what color belongs to what program. Now you have learned how to configure “Remind Me”. In the third part of the series you will learn how to actually fill in your hours while looking back into time.